We provide the full range of accountancy and tax services including accounts preparation, tax returns, VAT, payroll, management accounts, business plan development as well as the implementation of accounting software and systems. In addition to these key accountancy service’s we have seen significant growth in the number of businesses who value our management information service. We provide regular meetings with business owners and management to review past performance and more importantly help in future planning, forecasting and decision making. The use of Cloud accountancy services such as Xero has meant we can act as a virtual Finance Director to even the smallest of businesses. Regular management meetings either in person or via Skype mean we can help you steer the business providing business, tax and financial advice at the right time. In addition, close links with other key professionals mean we can quickly form a key part of your management team. Switching accountants is not difficult. We manage the entire process liaising with your old accountant as well as reviewing the previous years’ work free of charge to ensure all work has been completed to a satisfactory standard and advising on any changes. If not, we suggest ways that any issues can be resolved. For more information on switching accountant before taking the plunge read our e-book “Switching Accountants – why make the change and what to consider to ensure you make the right choice” for top tips. We offer a free initial meeting to review your requirements and prove that we are the right accountants for your business. To book a meeting use the adjacent online booking tool or give us a call. The team at Mollan & Co are professional, friendly, and always available to provide advice and guidance on a range of matters. 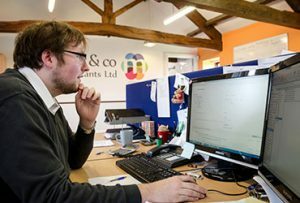 The way Mollan & Co is set up means that we have a dedicated point of contact within the accountancy team. This is really valuable. Mollan & Co has also offered sound advice on the development of our business. Mollan & Co are a professional accountancy service who operate with a personal touch, we have used them for many years and they have consistently provided us with an excellent service. Mollan & Co have provided a friendly and professional service over the 6 years they have acted for Cooper & Hall. Their advice on incorporation of our business has proven invaluable and we continue to receive the benefit of this advice. Along with the fact prices are very competitive we have no hesitation in recommending them or the services they provide. tax planning advice, tax investigations.